The Bluestone Road Bridge over Jacksons Creek is a double arched bridge with adjoining abutments, constructed of blue stone with Flemish bond block work and ruled joints. The two span bridge has elliptical shaped arches both measuring 13.4 metres. The bridge was opened in 1870 and replaced an 1857 bridge. The bridge has two integral blue stone parapets and end walls; the piers are topped with rounded basalt capping stones. One of the piers rises from a basalt outcrop which is visible near the riverbank. The juxtaposition of the building material in its natural form against the carved and worked dimension stone of the base of the bridge is aesthetically pleasing. The Bluestone Road Bridge over Jacksons Creek is of architectural and historical significance to the State of Victoria. 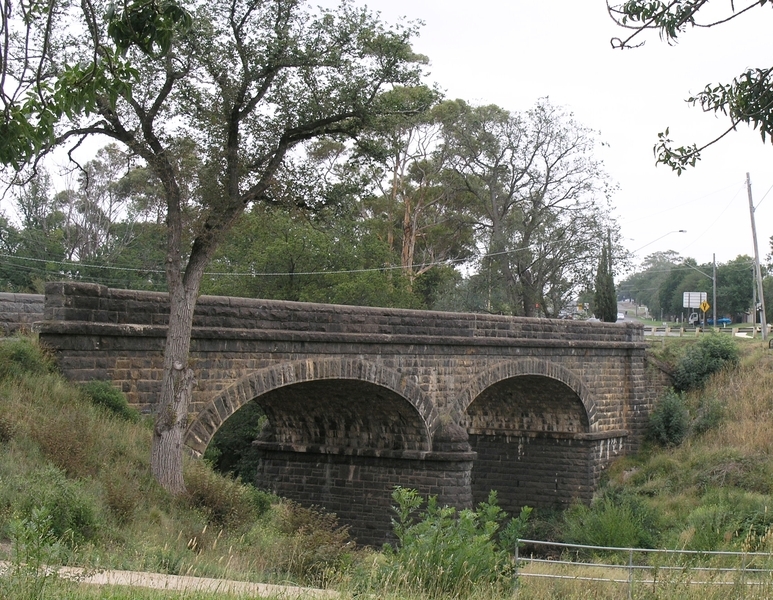 The Bluestone Road Bridge over Jacksons Creek is of architectural significance as an exemplary example of a Victorian Stone bridge. The bridge is representative of bridges constructed during the 1860's and 1870's however the combination of narrowing piers, the rounded tops to the piers and the elliptical arches, results in a particularly elegant stone construction. The bridge demonstrates the use of local dimension stone and illustrates the quality of craftsmanship of the time. While there are other examples of masonry bridges from the same period in Melbourne and regional Victoria, many of them have been altered to cater for the rise in motor vehicular traffic. The bridge over Jacksons Creek remains unaltered and has not been subject to alterations or adaptations. The bridge over Jacksons Creek is significant as a visual reminder of the evolution of early bridge construction techniques and for the individual design approach taken by its creator. The bridge over Jacksons Creek remains an outstanding example of a bridge built in the period 1860 to 1870. The Bridge over the Jacksons Creek is of historical significance for its association with the goldrush era in Victoria's history. Road construction was accelerated following the economic boom of the gold rushes in Victoria and the Jacksons Creek Bridge was constructed in direct response to this, replacing an earlier timber bridge. The replacement of bridges was not uncommon in the early years of Victoria's cultural history and it is not unusual to find that bridges were replaced two or three times in one location as bridge construction techniques improved and an increase in traffic necessitated upgrades. The bridge over Jacksons Creek assists in a greater understanding of the development and impact of 19th century gold mining activities in the State and the resultant need for transport systems. Bluestone Road Bridge over Jacksons Creek, Sunbury, Hume City Council. 1. 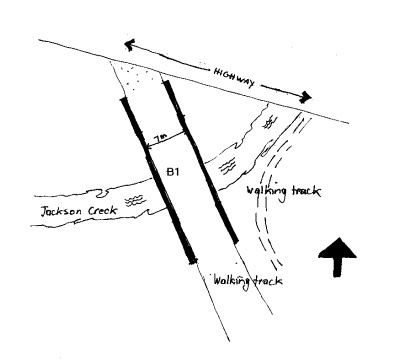 To the extent of the entire bridge known as Bluestone Road Bridge over Jacksons Creek including all of the structure, its approach spans and abutments as marked B-1 in Diagram 607040 held by the Executive Director. The need for infrastructure in a rapidly expanding settlement necessitated the construction of Australia's first roads shortly after the arrival of the first settlers. A first roadmap for Victoria dates from 1837. In 1838, the New South Wales Government authorised a survey of a road from Sydney to Melbourne and a contract was let for a fortnightly mail journey between the two centres. This route passed through Kilmore to Seymour and then along the present Hume Highway to Albury. Due to the gold rushes of the 1850's there was rapid growth in economic activity in Australia. Investment in roads and railways helped establish the national transport system and bridges formed important links in this expanding network. The earliest Victorian bridges are not easy to trace, as they were apparently minor (often timber) structures on rural or makeshift roads. Many bridges were opened at the time of the major railways in the 1860's and the expanding road works around Melbourne. There are several other examples of masonry (blue stone bridges) in the area. The present bridge at Bulla over Deep Creek (higher section of the Maribyrnong River) has four 8.2 spans and dates from around 1869. The blue stone bridge at Sunbury has two 13.4 meter arch spans and dates from 1870. The Government Gazette announced in 1857 that a tender to build a bridge over Jacksons Creek had been granted to Evans & Meery. The total cost of the bridge was 2044 (33) pounds. The bridge over Jackson Creek is essentially a very elegant specimen of a typical Victorian Stone bridge. 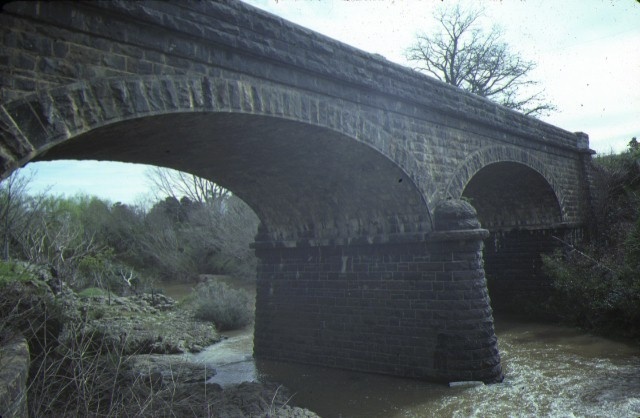 There are several examples of the masonry bridges from the same period in Melbourne and regional Victoria. Although some of them have been altered to cater for the rise of motor vehicular traffic, most of them are in good condition. There is variety in shape, size and character. The bridge offers additional interest because of the commemorative plaques, the two styles of rusticated stone surfaces and the gargoyle. Compared to other blue stone bridges it is relatively large. Other bridges such as the Newlands Road Bridge in Coburg has three 9.1 meter spans and was built by prisoners from the Pentridge Goal. At Waurn Ponds, a small stone bridge carries a crest and the inscription "Barrabool Shire. 1868". The Bridge at Bulla over Deep Creek is located at an important site as a fort appears to have existed around 1837. The bridge has four 8.2 meter spans and was constructed around 1869. Its spans are smaller that the Jacksons Creek bridge. The piers of the Bulla Creek bridge are also emphasised with rounded capping stones. The shape of the piers is less dramatic although they also widen towards the base. unusual to find that bridges were replaced two or three times in one particular location. damage to the fabric of the registered place or object.